There are base trims in the market which invite attention with their quality but the way BMW put it becomes outstanding. BMW 520i is although a starter for the 5 series it has been given due respect due to excellent category leading characteristics. It comes with many qualities and a few drawbacks, in fact only two or three. But these cannot overshadow that attractive list you are going to get while visiting a showroom. 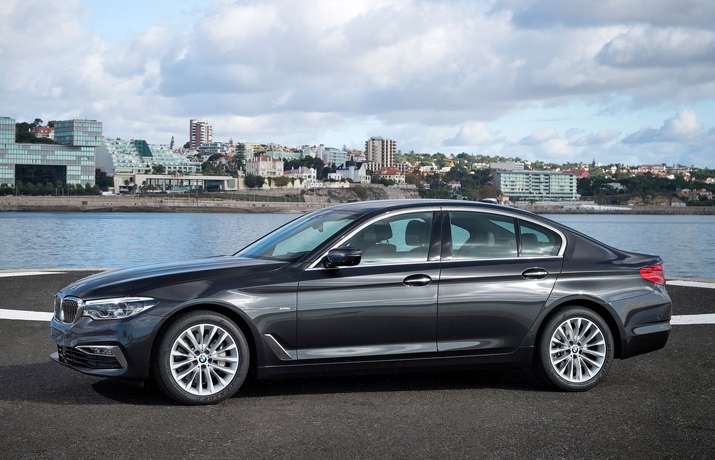 It is the cheapest among BMW 5 series going to provide you with that lovely BMW experience which would have been a dream if this one was not around. There are more luxury and more techs in the present 5 series a little absence of that 3 series driving fun. But the engine is not a flat one, it is quick in responding and happily accepts any further try to gain more speed. The rear visibility is somewhat effected due to the steep angle of the rear windscreen but this problem can be solved with the surround view camera. This gives a good view of the car making every move safe. The infotainment section also projects fine controls and graphics through the touchscreen. Apart from providing entertainment it also facilitates to alter the driving modes which somewhat changes the feel of going. For judging anything about this saloon, one thing must be in mind that it is the lower trim and obvious difference are there as compared to the higher ones. The engine which powers this ride is a 2 litre turbocharged with 184 bhp. It is paired with an eight-speed automatic transmission but there is an option of manual gear change also. The gears change smoothly whether it is the upward speed or coming down. The 0-62mph sprint takes 7.8 seconds which is a good one for this level car. The engine does not feel underpowered and takes it easy when revved harder beyond its limit. In reality, there are things which turn out to be more than what is said on the paper. That’s why BMW engines are no doubt the best ones around. This is the most successful area of the BMW 5 series and the same as in the discussed model. There are soft closing doors, head up display to project speed and navigation instructions on the windscreen. The interior is of high quality with many up to date technologies. The main concern is to make the interior feel as close to a limousine as possible making it more inclined towards the business side. People at present do prefer these areas while choosing a luxury car and it is exactly what they are going to get over here. 520i engines supply and fit are also easily approachable and it is a valuable service provided in the utmost reliability. To facilitate the driver as well as the passengers there are many gadgets to assist in any situation. There is an auto start-stop, key-less push button, cruise control, hill start assists, steering audio control, Bluetooth, auto wipers, navigation, electric steering adjustment, front and rear parking sensors, automatic windows and keyless operation locks. Besides these there are power adjustable front seats with memory function for the driver’s side, the dual zone climate control system is present for the front as well as the rear area. You get more out of less and this is the unique feature which only BMW delivers to its worthy customers. Safety side also has all the essentials present with Anti-Lock braking system (ABS), stability control, immobilizer alarm, seat belts and airbags all these are present.